Medical Science is going through great and rapid changes. One might say that it is actually in a state of revolution and of strife. But it is not the strife of mere discord, it is the “stress and storm” of growth of creative evolution. Many limitations are being overcome, much resistance is being vanquished; new fields, wide and promising, are being discovered, new light is obtained on the causes of human ills, and new efficient methods to heal them are constantly being found and used. I think that the members of the “English Speaking Union”, and their friends may perhaps be interested to hear a rapid review of some of the changes which are going on, and to be informed about the latest developments in the art of healing. Two great new facts. two important discoveries have started the radical transformation now going on in the field of medicine. The first one is the scientific recognition of the enormous, practically unlimited influence of the mind (in its widest sense) upon the body. The second is the discovery of the subconscious and of the superconscious psychologically activities, which are continually going on within each of us. The first one is not in itself a real “discovery”, as the influence of the mind on the body has always been more or less recognized, but during the period in which scientific materialism and positivism were the ruling influences, that is chiefly from about 1870 until lately, the greatest stress was put on material causes of disease and upon the influence of the body upon the mind, while the power of the mind upon the body was practically neglected. “As long as 1878 Richet, who had occasion to study a girl whose esophagus was closed and who was fed through a gastric fistula, reported that whenever the girl chewed or tasted a highly sapid substance, such as sugar or lemon juice, while the stomach was empty, there flowed from the fistula a considerable quantity of gastric juice. A number of later observers have had similar cases… All these observations clearly demonstrate that the normal flow of… the saliva and gastric juice is favoured by the pleasurable feelings which accompany the taste of food, or which are roused in anticipation of eating when choice morsels are seen or smelled (p. 7-8). “Again — continues Prof. Cannon —just as the secretory activities of the stomach are unfavorable influenced by strong emotions, so also are the movements of the stomach; and, indeed, the movements of almost the entire alimentary canal are wholly stopped during great excitement. Indeed, the opinion has been expressed that a great majority of the cases of gastric indigestion that come for treatment are functional in character and of nervous origin. It is the emotional element that seems most characteristic of these cases. To so great an extent. this is true that Rosembach has suggested that as a term to characterize the cause of the disturbances, “emotional” a dyspepsia is better than “nervous” dyspepsia” (pp. 14 and 18). The intestine is affected as the stomach by the emotions. “Mild affective states, such as worry and anxiety — says Prof. Cannon — can, to be sure, check the activity of the colon and thus cause constipation” (p. 27). Other important effects of the emotions on the bodily functions are proved by the experiments and observations of Prof. Cannon and of many other scientists. The inner secretions of glands, such as the adrenal glands, are deeply affected by emotional states, so that glycosuria can be produced. For instance a pupil of Prof. Cannon, Mr. Smillie, found that four out of nine medical students, all normally without sugar in their urine, had glycosuria after a hard examination, and only one of the nine had glycosuria after an easier examination. Even the healing of wounds can be con­siderably affected by the mental state of the patient. An American surgeon, who had been in charge of a Red Cross hospital during the Balkan wars, assured me that he had observed that the wounds of the soldiers belonging to the successful nation healed more rapidly and normally than those of the soldiers who were worried and anxious because of the invasion of their land by the enemy. The second epoch-making discovery of modern science is — as already mentioned —that of the existence within ourselves of a vast realm of psychological (mental and emotional) activities, of which we are not directly aware and which we ordinarily take no pains to in­vestigate. “… most of us behave like the owners of a well-furnished room, who ignore every aspect of it except the window looking out upon the street. This we keep polished, and drape with the best curtains we can afford. But the room upon which we sedulously turn our backs contains all that we have inherited, all that we have accumulated, many tools which are rusting for want of use; machinery too which, left to itself, may function satisfac­torily, or get out of order and work to results that we neither desire nor dream” (p. 89-90). One can form some idea of the enormous proportions and importance of this subconscious part of ourselves considering that, according to some authors, not less than 90 to 95 percent of our mental life belongs to it, and only 5 to 10 percent is present in our every-day consciousness. It is indeed uncanny to think of this great mystery that we constantly carry within ourselves and this realization makes the explo­ration of this inner realm a matter of fasci­nating interest. I cannot dwell on the reports of the first travellers in this unknown land, which may be compared to the first reports of the amazed explorers of the new continent. Those who want to get a vivid and dramatic view of the extent to which this subconscious life can expand, arriving at the creation of different personalities within one body, which engage in a fierce light for supremacy, can find it in the book of the well-known Boston neuro­logist Prof. Morton Prince, The dissociation of a personality. The facts contained in his cold and matter-of-feet scientific report beat the most daring imaginations of the novelists, and compared to them even The Strange case of Dr. Jekyll and Mr. Hyde appears much simpler and not quite so strange. But tonight I must limit myself to touch only on a few points of medical interest. The studies on this subject have shown beyond all question that the intense and com­plicated interplay of psychological forces which is going on below the threshold of our conscious personality has a direct and profound influence upon our bodily functions — a much greater one than that of our conscious mental activity. The multifarious and passionate life which is going on in the depths of our inner beings brings about many complications and con­flicts. In those obscure realms a regular “strug­gle for life” is going on among the various instincts, impulses, emotions, ideas, desires and imaginations. All kinds of dissociations and blendings, repressions and transformations, alliances and fights, are continually happening there. It is not surprising that these compli­cations and fights may, and do often, produce serious troubles in our physical and mental health. These facts may at first appear troubling and discouraging, but a further consideration easily dispels this impression and opens on the contrary new bright vistas of hope and faith, explaining why ordinary medicine fails in many cases and pointing towards new and more promising methods of healing. It appears obvious that in all cases in which the chief cause of the trouble is psychological, the resources of materia medica are unable to bring about a real and permanent cure. These physical means can only obviate or palliate temporarily the effects, but have no power to eliminate the causes. On the other hand one can easily see that the psychological complications and conflicts which are responsible for the trouble can be completely and permanently eliminated by the proper use of other powerful psychological influences. These forces can and do work both ways. It is a fact beautifully symbolized by Richard Wagner in “Parsifal” when speaking of King Amfortas’ wound: “Only one weapon avails, only the spear which has in­flicted the wound can heal it”. On the sure basis of these facts and principle is founded a new important branch of haling, that is to say scientific psychotherapy. Though recent, this kind of medical treatment has already gained considerable ground and can claim many brilliant cures. Yet it has by no means reached its full development and its methods are subject to constant revision and improvement. This condition, while it proves its vitality, is apt to create some uncertainty and confusion among the public, and even among doctors who have not made a special study of the subject. So I think it might be useful to give a short and clear view of the two methods of psychotherapy now most widely practiced: that is, suggestion and psychoanalysis, and to give some idea of a new and more comprehensive method, called psychosynthesis. Suggestion is a powerful means of mental influence and treatment, which was known and practiced before Coué. Coue’s undeniable and startling successes were due not only to the technical value of his method, but also to his personal qualities, to the faith, to the great human sympathy and love which animated him, and also to the favourable psychological atmosphere created by his popularity. Coué’s theory and method, while they are too simple, crudely expressed and very one-sided, do yet contain a vital germ of truth. This good seed, as it has been ably developed by Professor Charles Bandoin in his book Suggestion and autosuggestion, has become an important part of scientific psychotherapy, which has its proper field of application and can give very good results when suitably and ably used. Suggestion can be very efficacious in all the simpler cases of nervous and bodily troubles, the chief cause of which is to be found in the worry and depression of the patient and in his fear of his own illness, a fear which causes an intensification and fixation of his troubles, determining a real vicious circle. The use of suggestion can eliminate that worry and fear, change depression into serenity, pessimism into optimism, awaken courage and confidence. Thus the vicious circle is broken and the natural recuperative powers of the body, helped by other medical and hygienic measures, bring about a rapid recovery. On the other hand suggestion fails in bringing about a real and permanent cure in cases which are more complicated, being due to deep disturbances in the subconscious life, to serious inner conflicts. For such cases finer and more subtle methods are needed. One of these is psychoanalysis. Psychoanalysis has been and is even more passionately discussed than suggestion — and that is well, because, while it has some very fruitful and genial aspects, it is also dangerous, and, when indiscreetly used, is apt to cause very real harm. The great value of psychoanalysis lies in the fact that it offers an ingenious and efficient method of exploring the subconscious, of recovering the hidden conflicts which cause the trouble, of removing the harmful repressions, of liberating ‘useful energies. But unhappily Professor Freud, the originator of psychoanalysis, and even more many of his followers, has associated it with a mechanical and “positivistic” conception of life, have given a most exaggerated importance to the sexual element, have arrived at absurd excesses in their fanciful symbolic interpretations of dreams. And even in its better and saner aspects psychoanalysis cannot deal with all the cases. Against the troubles due to the deepest and most fundamental problems of human nature psychoanalysis fails. To discover the conflict is often not sufficient in order to solve it: sometimes the discovery makes it even more acute; to liberate repressed energies is not enough: if proper measures to have them duly utilised and harmonised are not taken, they might cause more trouble than before. And there is a whole series of problems and con­flicts connected with the spiritual nature of man, which require a broader, higher, more comprehensive method. Psychosynthesis aims at being such a method. Psychosynthesis, as its name indicates, is founded upon the principle of organisation around a central point, of ordered, hierarchy, of synthesis. While descriptive, experimental and beha­viourist psychology, as well as psychoanalysis, are directed towards the analytical and objec­tive study of psychological phenomena as such, and consider mental life as a mechanism ruled by fixed laws, psychosynthesis starts from the human centre of the living being, from the self; and studies all psychological facts in their vital relationship with that centre. Psychosynthesis considers — reviving the old conception of Plato — the human being as a state, composed of many citizens, groups, and lesser organisations. The troubles which take place in the human being can be compared to those which rise in a nation which is badly or inefficiently governed, and in both cases the solution, the cure, can be found only in an improvement and strengthening of the central power. This psychosynthesis is based on the study and the action of the self. Now the question arises: What is, or rather, who is the self in us? The answer may at first appear easy and simple, yet it proves very difficult. The ego, of the reality of which we seem to be most sure, strangely eludes and battles us when we try to grasp it. I will not enter now into the complica­tions of this question, but will state only that for all practical purposes, we may, and we must, distinguish two kinds of selves: the personal self and the individual or Spiritual Self, and to these correspond two kinds of synthesis: psychological or personal psychosynthesis, and indivi­dual or psycho-spiritual synthesis. The personal or psychological self is the conscious self of the normal human being, the centre of his personal interests, of his emo­tions, passions, desires and aspirations; in the higher sense it is his conscience, his reason, his moral nature. In a healthy person this self has, ordinarily, a fair amount of direct control over his conscious personality, and such an indirect control over the subconscious elements sufficient to avoid too acute clashes, agitations and rebellions. But when this normal peace and this relative harmony are menaced or destroyed by the outburst of a passion, by an external e­mergency, or by a weakening of the grip on the part of the sell, it becomes necessary to establish a new order, a new and more power­ful rule. To obtain this, both suggestion and psychoanalysis prove often insufficient, as they leave out of consideration the central factor involved: the self, while the aim desired can be attained, as we will see presently, by the proper application of psychosynthesis. The question of the individual or spiritual Self is a more difficult and obscure one, but it has been somewhat elucidated by the modern studies on the superconscious psychological activities which are going on in the human soul. Frederick Myers has been the first to make an extensive scientific study of these facts, in his well-known work on The subliminal self. More recently Evelyn Underhill in her classical book on Mysticism has given us a good, though still approximate, chart of those high inner realms. These and other studies, as well as the direct records and testimonials of many individuals, oblige every unbiassed person to admit that there is in us a higher kind of psychological activity, which habitually transcends the everyday consciousness, but which can make a connection with this on more or less frequent occasions. From these higher levels come the inspiration of the great artists and prophets, the illuminations of the mystics, the flashes of intuition, the great decisions which lead to heroic deeds. This higher inner life must have, as our normal one, a center from which it manifests and which directs and controls it: this center is the individual, or spiritual Self. As has already been said, in many persons the spiritual or superconscious Self remains for all practical purposes latent, and as if non-existent — but there are many others in which it begins to make itself felt, to try to influence the personal self. This fact creates at first a new complication: the existing synthesis is disturbed, and the personal self ignorantly resents this disturbance. There is thus a definite repression of the higher impulses which is quite similar to that of the lower ones, discovered by psychoanalysis. This is a key which explain many facts: for instance why certain persons show such a marked hostility towards spiritual subjects. Yet we must not blame nor judge these persons: hostility is better than indifference and at any time the resistance may be overcome, the personality flooded by the light of the spirit and the whole attitude reversed. What happened to Paul can and does happen, on a lesser scale, to many persons . These conflicts between the superconscious and the conscious selves are moreover often complicated by the intervention of subconscious elements. Our subconscious is really a menagerie full of strange in imps always ready to make trouble and play nasty tricks! Thus are produced many serious physical and psychological troubles, which are not as yet generally recognized and understood, either by the patients or by the doctors. These troubles are often of long duration, battling all ordinary medical and psychotherapeutic treatments. These are clearly cases for the use of what I have called spiritual psychosynthesis, which consists in the incorporation (so to say) of the active superconscious elements in the personal make up; in other words, in the harmonisation and a more or less complete blending of the personal with the higher self, creating thus a wider and richer synthesis. The psycho-spiritual diagnosis, that is the study of the whole subconscious and (when necessary) superconscious constitution of the patient; the classification of his psycho-physical type; the discovery of the psychological causes and mechanism of the illness. The reconstruction of the personality, by lite alternate or combined use of all the psychological tools existing: suggestion, persuasion, analytic explanation, teaching of the patient, active reeducation, etc., but none exclusively or as an end in itself, but all directed and subservient to the central purpose of creating the new synthesis. The study of the experiences of those who have successfully achieved the epigenesis; regular and graded exercises of concentration, meditation and “silence”; the development of true intuition and of the power of discriminating between the promptings of the higher Self and the impulses or suggestions from the subconscious; the development of a willing obedience to the higher intimations; an active and intelligent cooperation with the process of assimilating the spiritual elements in the personality. But in the case of patients, who generally have a particular sensitiveness and special difficulties to overcome, the use of all those means must be wisely advised and regulated by the doctor, in order to suit the psychological type and the possibilities of each patient, to avoid the danger of excesses and exaltation, to prevent as much as possible the reactions and complications which easily occur in such cases. This does not mean that there should be any claim to regulate in an artificial way the free and spontaneous creative activity of the spirit; on the contrary it means preparing the paths for its manifestation, retrieving the obstacles and helping the personality to assimilate it in a harmonious and healing way. In this lecture I have been able to give only a rough and sketchy outline of so wide and manifold a subject, but I hope to have succeeded in showing that the new line of healing represented by psychosynthesis is full of promise and deserves to be taken up by serious and advanced doctors. 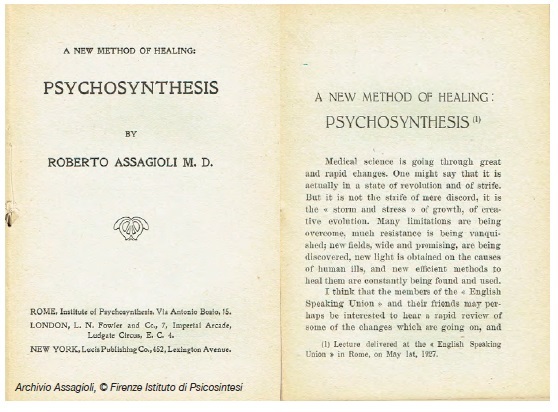 I would like to add that psychosynthesis, as I conceive it should not only be a method of treatment of physical and psychological ills, but ought also to develop as a method of education and of self-education, as it represents not only an ideal of health and harmony, but also of dynamic development and growth of personality. When it will be generally known and practiced, it may even be extended to social life: it may become a method of eliminating misunderstandings and unnecessary conflicts between individuals and groups, and point out the principles and methods of a wider, more harmonious and real human synthesis. May it thus contribute to the preparation of a healthier, better and happier humanity. I want to emphasize the fact that psychotherapy does not in any way exclude proper medical treatment of a physical nature; on the contrary both kinds of treatment can and do very well co-operate and help each other and the wise doctor, by an appropriate and varied combination of psychological and physical influences, will obtain much better curative results than these who use exclusively the one or the other means. The most impartial and reasonable statement of the better aspects of psychoanalysis and of their ap­plication to constructive ends (although falling short of a true understanding and appreciation of the spiritual side of human nature) is contained, in my opinion, in Dr. B. M. Hinkle’s book The re-creating the individual (New York, Harcourt, Brace and Co.1923). The deepest and most searching discussion of psy­choanalysis from the metaphysical and spiritual stand­point has been made by the great German philosopher Count Hermann Keyserling in his new book Wiedergeburt. (Darmstadt, Reichl, 1927). See chapters: Psycho­analyse und Selbstvervollkommmnung and Heilkunst und Tiefenshau. A poetic and very dramatic illustration of the fight between the deliberate urge of the spirit and the stubborn resistance of the personal self is contained in Francis Thompson’s famous poem The Hound of Heaven. (11) The description and interpretation of the “psychological types” have not yet reached, in spite of their valuable recent developments, a final and satisfactory stage, owing chiefly to the lack of a synthetic standpoint and of the proper consideration of the spiritual elements. The best which has been published up to now on this subject is found, in my opinion, in C. G. Jung’s book Psychologische Typen and in two chapters (A study of psychological typen and Masculine and feminine psychology) of the book, already mentioned, of Dr. Hinkle, The recreating of the individual.